HangarGearTM: Stuff you can live without, but why would you want to? You really have to see this skin on your WinAmp agent to fully appreciate the masterpiece. Although the picture is condensed, the actual skin is normal size and includes the Main window, Equalizer options, and Playlist editor. 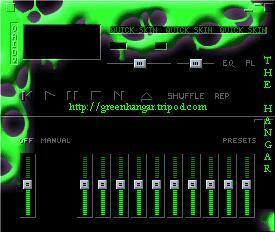 Save the file to the skins subdirectory in your WinAmp folder, and enjoy THE HANGAR even when you aren't online!